How do dolphins see underwater and what is echolocation? Home > About whales & dolphins > How do dolphins see underwater and what is echolocation? In general, as well as having extremely good eyesight that allows them to see both above and below the water, toothed whales use a sense called echolocation to navigate and hunt underwater. This means that they emit sound waves and then detect and interpret the echoes that bounce back off of other creatures and objects in the water around them, allowing them to build up a picture of their surroundings. Dolphins hunt using their highly-developed echolocation, which means they can find food no matter how murky the water might be. Not only that but they can even use it to identify any prey that might be hiding, such as under the sand! Sperm whales also use echolocation to find their way around the dark depths of the ocean and to help with hunting for squid. Though only very brief, the clicks they make are the loudest sound in the animal kingdom. 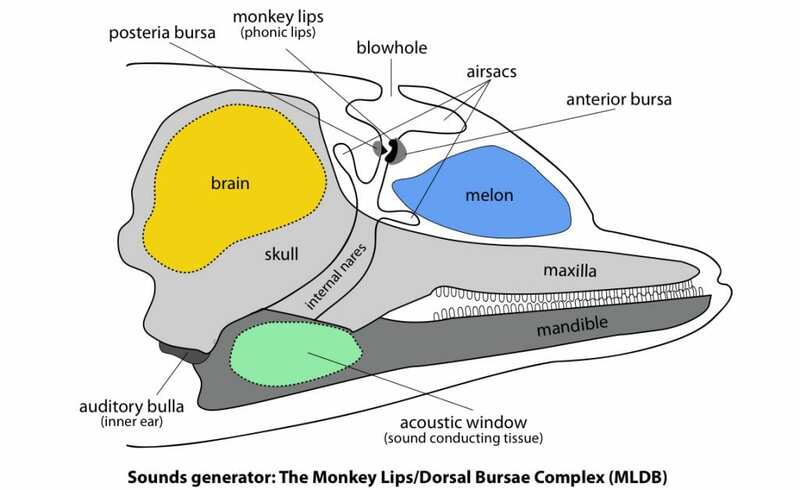 How do whales and dolphins hear? Whales and dolphins do have ears but they don’t have external sticky out ears like ours to funnel sound as they need to be streamlined for life in the water. Their ear canals are not open to the outside. Instead, they generally hear sounds through special structures in their jawbones. Communication amongst whales and dolphins is achieved in several ways. They create sounds, make physical contact and use body language. Large whales can communicate over huge distances (across entire ocean basins) using very low frequencies. Dolphins and porpoises however, usually use higher frequencies, which limits the distance their sounds can travel. In general, dolphins make two kinds of sounds, “whistles” and “clicks”. Clicks are used to sense their surroundings through echolocation, while they use whistles to communicate with other members of their species and very likely, with other species too. It is also thought that each dolphin has a unique whistle called a ‘signature whistle’, which is used to identify an individual.